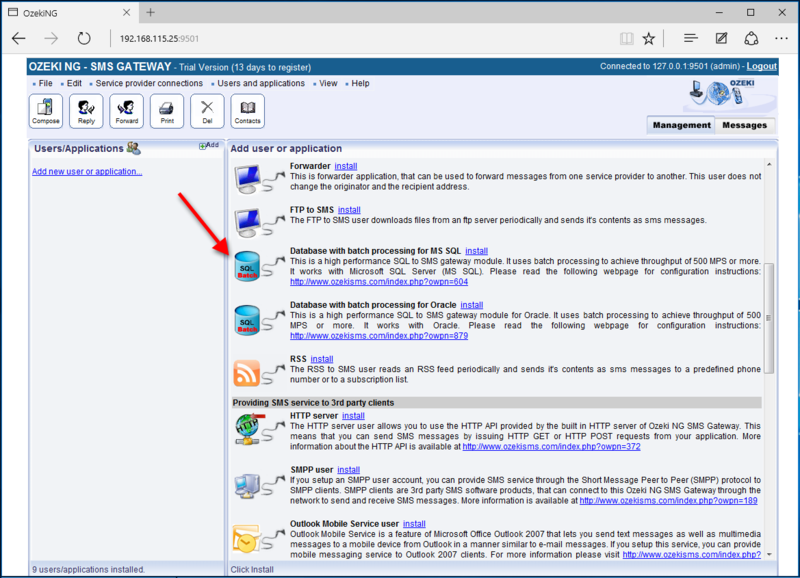 This guide gives you information on how to configure your Ozeki NG SMS Gateway software to achieve a performance of 500 Messages Per Second (MPS) or more in an SQL to SMS gateway environment. The solution is based on MS SQL server and it requires the installation of the ozAppMSSQL.dll file. 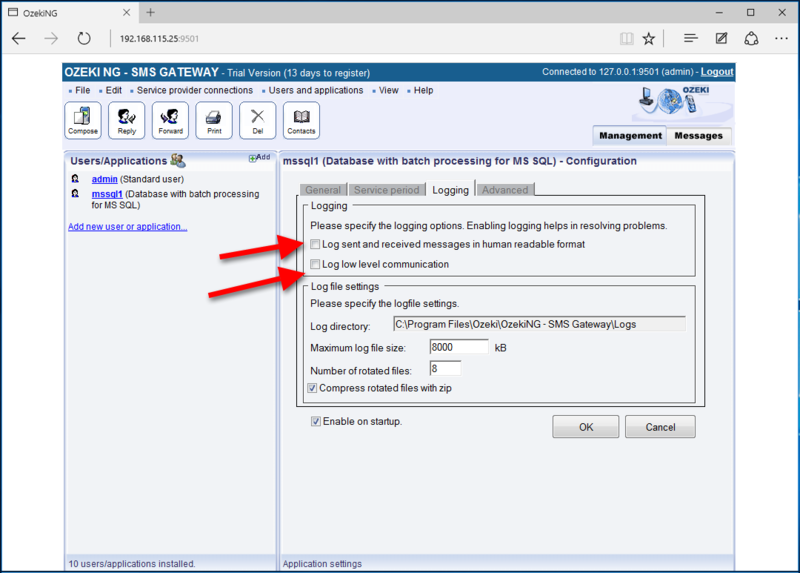 The configuration works the following way: Ozeki NG SMS Gateway connects to an MS SQL Server 2008 database. It reads outgoing messages from this database and sends these messages to the Short Messages Service Center (SMSC) of an SMS service provider over the Internet through an SMPP connection (Figure 1). For this solution to work you need Microsoft SQL Server 2008 (or Microsoft SQL Server 2005). In MS SQL you should create a database. The recommended name for the database is 'ozeki'. You should also create a user with SQL server authentication, who can connect to this database. The username should be 'ozekiuser', the password should be 'ozekipass'. In the database, create the following table structure, and grant SELECT,INSERT and UPDATE privileges to the ozekiuser user. If you take a look at this table structure you will notice several differences to the default table structure used in the standard Ozeki SQL to SMS solution. The first difference is that the ozekimessageout table contains a stat field instead of status and this field is an integer. The reason for the change in the name of the field is that the status word is a reserved word in MS SQL. The reason for the change in the field type is that it is significantly faster to update integer values, then to update strings in a database. After you have inserted a message for submission, Ozeki NG SMS Gateway will read it and will change the value of the stat field to '2'. This indicates that the message is queued for delivery. A few moments later Ozeki NG tries to submit this message to the SMSC. If message submission is successful the value of the stat field is updated to '3', if message submission fails, the value is updated to '4'. In addition to this update a new record is inserted into a different table called msgreferences, to give you details about message submission results. This brings us to note the second change in the database structure: There is a new table called msgreferences. 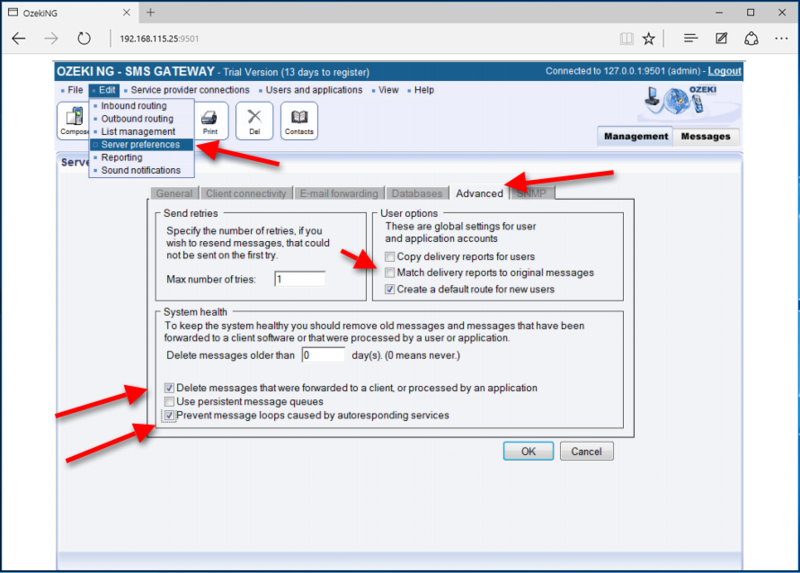 This table contains records that are inserted by Ozeki NG SMS Gateway after a message is successfully submitted to the SMSC or after the message submission fails. The 'id' field in this table contains a value matching the id field of ozekimessageout (this is a foreign key). The second field, called reference, will contain the callback id (message reference value) returned by the SMSC after it accepted the message for delivery. The senttime contains the timestamp of message submission and the error message field holds a text explaining the error in case the message could not be submitted to the SMSC. The reason for introducing this table was that it is faster to insert a new record into a database table then to update an existing record with new text content. Once your database is defined, you are ready to setup Ozeki NG SMS Gateway. To start download Ozeki NG SMS Gateway from the download page, then run the setup wizard by clicking "Next" in each dialog box. This will give you a default configuration. The first step in configuring Ozeki NG SMS Gateway, is to configure a mobile network connection. In our example this is an SMPP connection. The SMPP service connection setup page gives you details instruction on how to setup SMPP. If you could successfully configure your SMPP connection, you should test connectivity by sending a test message from the graphical user interface to your mobile phone. Do this by clicking on the "Compose" button. 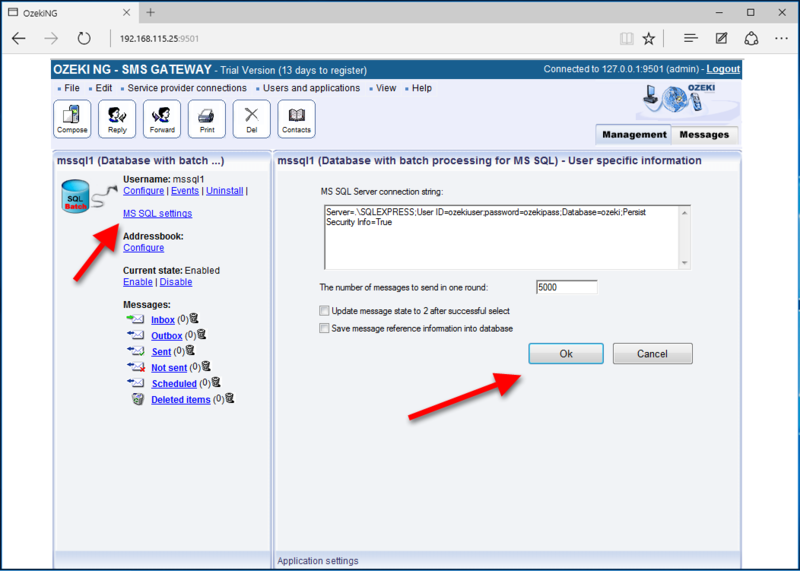 To setup the SQL to SMS gateway service, you need to setup an instance of the "Database user with batch processing" module. 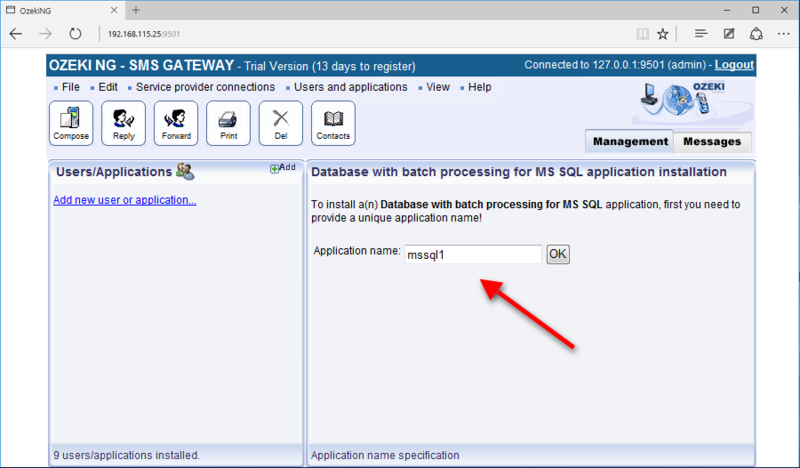 This can be done by clicking on "Add user" menu item the "Users and applications" menu, then clicking on "install" in the "Database user with batch processing for MS SQL" section (Figure 5). During the installation provide a unique user name. "mssql1" is a good choice (Figure 6). On the configuration form, that comes up after this, turn off logging, by making sure the "Log sent and received messages in human readable format" and the "Log low level communication" checkboxes are not checked. Logging should be turned off to get better performance (Figure 7). In this connection string change .\SQLEXPRESS to the name of the MS SQL server instance. If you want to use the default MS SQL server instance, this can be changed to a single dot: ".". Please also set the username and password and the name of the database (Figure 8). The appropriate configuration can be seen on Figure 9. Figure 9 - High performance configuration. To test the configuration you can insert several messages into the ozekimessagout database table and check the event log of Ozeki NG SMS Gateway to see the performance they were sent.